L'Italie divisee en ses differents etats Royaumes et Republiques. 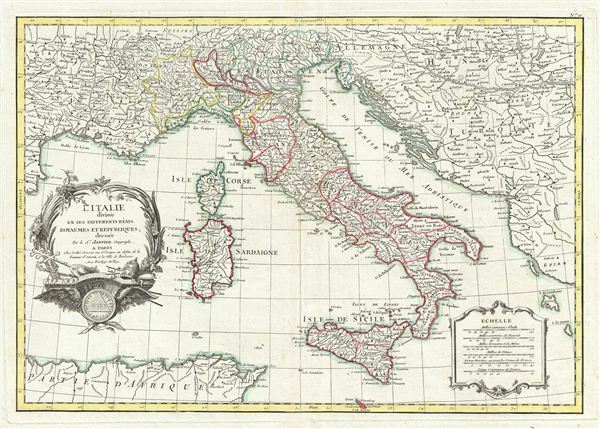 A beautiful example of Le Sieur Janvier's 1783 decorative map of Italy. Janvier's map covers from the Gulf of eyon eastward to include all of Corsica, Sardinia, Italy, the Adriatic, and parts of Hungary and Turkey in europe. It extends southwards to include adjacent parts of Africa and northwards as far as Lake Geneva. An elaborate title cartouche featuring Papal accoutrements appears in the lower left quadrant. A secondary cartouche bearing a six distance scales appears in the lower right. A fine map of the region. Drawn J. Janvier c. 1783 for issue as plate no. 10 in Jean Lattre's 1783 issue of the Atlas Moderne. Rumsey 2612.027. Phillips (Atlases) 664. National Maritime Museum, 215.